The Cayman Islands are much more than a tax haven for wealthy expats. Andrew Doherty discovers a paradise for nature lovers, foodies and history buffs.
" realise the local saying is true: when you come to the Cayman Islands you really do experience the unique blend of culture, nature and experiences that defines Caymankind." I was familiar with the saying “Caymankind” before I arrived on the Cayman Islands. However, it was only after rubbing shoulders with the friendly locals, absorbing the history and indulging in gourmet farm-to-table cuisine that I came to understand its meaning. These islands, and their inhabitants made up of more than 100 nationalities, are exceptional. One of a kind, you could say. The Cayman Islands, a British Overseas Territory situated just south of Cuba and north west of Jamaica, is made up of three bodies of land, all of which can be reached from each other via a short regional flight. Grand Cayman, the main tourist destination, is packed with restaurants, bars and watersports activities; rugged Cayman Brac is popular for scuba diving; and Little Cayman is home to diverse wildlife. For Cayman’s many British expats and holidaymakers, British Airways operates flights four times weekly with a short stop in Nassau – a 12-hour journey in total. The Ritz-Carlton, my home for the week, is one of Grand Cayman’s high-end hotels, situated on Seven Mile Beach. It’s a key area for tourists and home to many of Grand Cayman’s best restaurants, beach bars and watersports facilities. There are more affordable properties on offer, however, such as the Westin hotel – also on Seven Mile Beach – plus self-catering apartments and condos. Despite being the most developed of the islands, Grand Cayman is blessed with beautiful beaches and natural attractions. The Crystal Caves opened in 2016 with guided tours through three of its 175 underground caverns. I meet my guide Donovan – a local who grew up exploring these limestone caves as a child. He takes me through the surrounding forest, using his extensive knowledge of the area to point out beautiful endemic bird species, medicinal herbs and the Caymanian national plant, the Silver Thatch Palm, once used to make rope for export. The caves were formed millions of years ago by tidal and tectonic activity and are named after the crystals that form on the stalactites and stalagmites. For me, the tour highlight is the light show in Lake Cave. I stare in awe as beams of colour bounce off the water to create ethereal effects on the cave’s roof and walls. Donovan says more caves will be opened up to accommodate ATV tours and a zipline is being installed too. 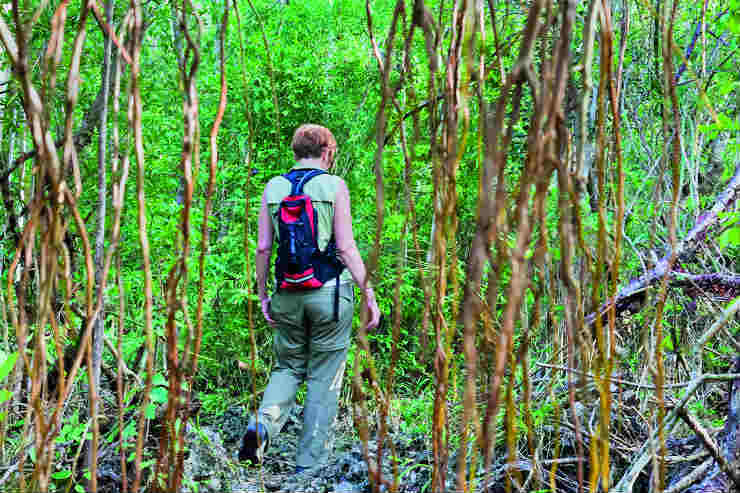 Another experience for those with a sense of adventure is the Mastic Trail – a three-hour trek through an inland forest that can be done independently or with a National Trust for the Cayman Islands guide ($29). My favourite nature experience is Stingray City. Hosted by Red Sail Sports, this is bookable through any hotel concierge and at the operator’s beach hut at the Westin hotel. The family-friendly activity sees me take a catamaran cruise to a sand bar just off Grand Cayman, where the water is less than a metre deep. It’s here that I meet a gregarious South African named Kevin, who is wallowing near a huge stingray named Scarface. “They can live up to 28 years in the wild,” he shouts. I stand in the water as the rays swim gracefully around me – it’s an experience I’ll remember for ever. A 20-minute drive from the capital George Town takes me to Pedro St James Castle, the oldest building on Grand Cayman (entry from $12). First constructed by Englishman William Eden in 1780, the house is the birthplace of Caymanian democracy, with political meetings and court sessions often held in its dining room. Pedro St James was also where the Slavery Abolition Act was first read to the public, signifying an end to the barbaric practice. In the 1990s, restoration work began and the site was eventually restored to its former glory. I spend an afternoon exploring its history, learning about the life of the owners and their slaves through authentic 18th-century tools, cooking utensils and mahogany furniture. While I don’t spot any ghosts from the past at Pedro St James, its onsite rum shop and miniature distillery is home to a variety of spirits. Here I meet Moises Sevilla, an American who moved to the island and ended up working for Cayman Spirits Co. He tells me that the company’s practices are unique in that they produce the world’s only rum that is aged underwater. Guests can pay $5 for a tasting session that allows them to sample coconut, banana and the dark rums of the Governor’s Reserve range and the Seven Fathoms brand that is sold in the UK. My favourite by a long shot is the 1780 Rum. This darker tipple is aged in port barrels underwater and has a treacle-like taste. It’s well worth recommending that visitors pick up a bottle, as it’s extremely rare and only available at this location. Cayman Spirits Co. may only be 10 years old, but it is bringing a thriving craft rum scene to the island. Co-owner Walker Romanica admits that this was lacking before it began operations. “I found that there wasn’t an authentic Caymanian rum and we wanted to create that. But really it all started as a bit of fun,” he says. The Seven Fathoms tour at the main distillery is priced from $15 and includes the same tasting session as the one available at Pedro St James Castle, with a guided factory walk. 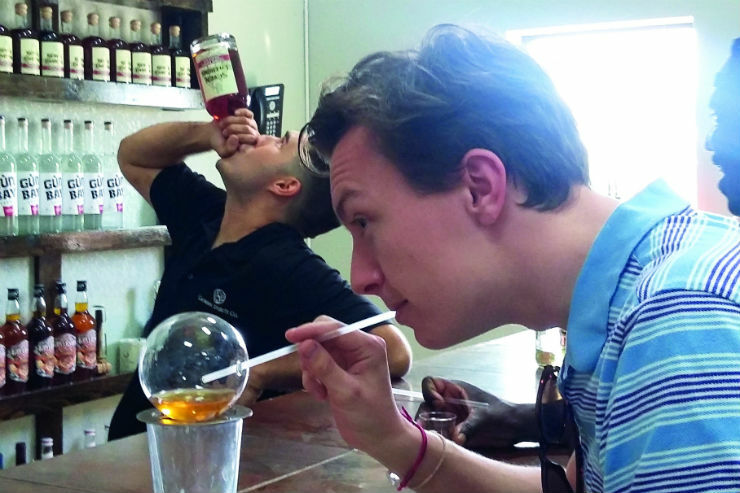 It’s fascinating to learn about the process involved in making the spirit, and I even try smoking rum vapour. favourite, Welly’s Cool Spot, which serves up a “mean” curried goat. But with the islands’ clientele including wealthy British expats and celebrities – Sharnette once chauffeured Vin Diesel – it’s unsurprising to find plenty of highend options too. These include the Grand Old House, The Lighthouse, Lobster Pot and Cracked Conch, all of which specialise in serving fresh seafood in oceanfront locations and all within a 40-minute drive of the main Seven Mile Beach properties. Rum Point Club, on the north of the island, is a relaxed beach bar and restaurant with food, drinks and watersports. I while away an afternoon lounging by the ocean, sipping Mudslide cocktails – a Caymanian take on the White Russian made with Baileys, vodka and Kahlua. During my stay, I manage a quick hop to Cayman Brac – a half-hour flight from Grand Cayman – to take in its majestic limestone plateau The Bluff, diving spots and a range of caves. This smaller island is ideal for clients looking to get away from the crowds. For hiking and nature enthusiasts, Cayman Brac has 15 walking routes and can be traversed from tip-to-tip in four hours. History buffs may enjoy visiting the Cayman Brac Museum (free admission), which houses a range of domestic artefacts and insights into the island’s past. I return to the Red Sail Sports hub for a sunset cruise that marks the end of my time on the islands. As we sail, I realise the local saying is true: when you come to the Cayman Islands you really do experience the unique blend of culture, nature and experiences that defines Caymankind. Book it: Caribtours has seven nights at The Ritz-Carlton Grand Cayman from £2,299pp on a room-only basis with flights and transfers included.